Personal Details: George Victor Cochrane was born in Bordertown, South Australia. He attended school at Nairne but spent most of his life in Langhorne Creek. His father, Hugh Angus Cochrane, had died prior to his enlistment and he lived with his widowed mother Mrs Hariett Cochrane. He had nine siblings. George stood 5ft 8inches tall, weighed 146 lbs had a dark complexion, brown eyes and dark hair. George Victor Cochrane was a Methodist and prior to his involvement in the War he worked as a gardener. Enlistment Details: George Victor Cochrane enlisted at Keswick on the 5th of March 1915. He was 22 years old. Details about his role in War: George embarked aboard the HMAT A61 Kanowna on the 23rd of June 1915. He was taken on strength from the 6th reinforcement and joined the 10th Battalion at Gallipoli on the 4th August 1915. He then travelled to Alexandria aboard the Seang Bee arriving on the 29th of December 1915. During his time at the front line on the 27th March 1916 he was promoted to Lance Corporal. He then travelled to Marseilles arriving on the 3rd April 1916 and joined the combat on the 20th July when his battalion was called in to reinforce the 9th battalion. On the 25th July George Victor Cochrane’s unit took part in an attack at Pozieres. The attack began in the very early hours of the 25th and by the end of the battle 355 soldiers were killed or pronounced missing in action. George Victor Cochrane was one of those killed. Age at Death: George Victor Cochrane was 23 years old at the time of his death. Interesting Material: After his death George’s mother Harriet and sister Ellie Maud sent letters to the AIF asking of the final resting place of George Cochrane. His burial site was not known until 1920, five years after he died. Letters were also sent from his elder brother Hugh Angas Cochrane requesting George’s Gallipoli medallion. His personal effects were sent home including a note book, belt, 6 coins, wrist watch and strap. His kit bag was also sent home which contained two military books, a bag, an auto strop, war map, scarf, four handkerchiefs and a knitted square. The following article was placed in the Advertiser on the 22nd Of August 1916. Word was received here yesterday by Mrs. H. A. Cochrane of the death in action in France of her second son, Lance- Corporal George V. Cochrane, on July 23. 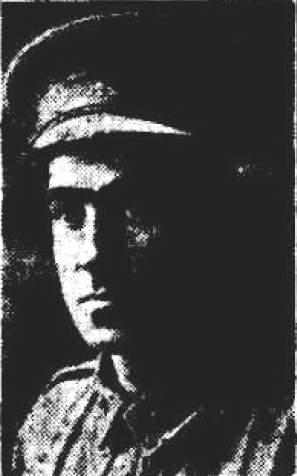 He was 23 years of age, and left South Australia on June 23, 1915. After serving for four months on Gallipoli he proceeded to France on April 2, 1916. Lance-Corporal Cochrane had lived here for the greater part of his life, and was much respected. He was a capable athlete, being one of the most prominent tennis and football players in the district. Two other brothers are serving at the front. Langhorne's Creek, August 19.